This is the most economical barn around! A Mare Motel can be easily sided with wood, giving your horses the protection they need in our mild western climate. Check the wood siding pages for more great ideas using our unique stall channel for creating wooden walls with your budget in mind! The least expensive R.V. Cover around! This kit measures 18' wide x 36' deep, and comes with heavy duty 17' posts. When set 3 1/2' deep in concrete, you'll have about 12' of clearance to park under. 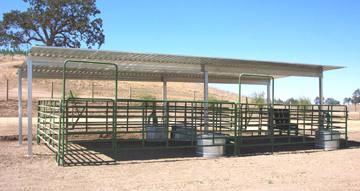 Put your own pipe panels under the 36'x18' and you have a quick, affordable shed row shelter. Roofs and post locations can be custom sized to fit around any size enclosure. With 12' posts, using two heavy 13 gauge posts in the middle. You can add siding to any kit, either horizontally, or vertically as shown. Call us for a quote on any size and style you need. Colored roofing and siding are also available. 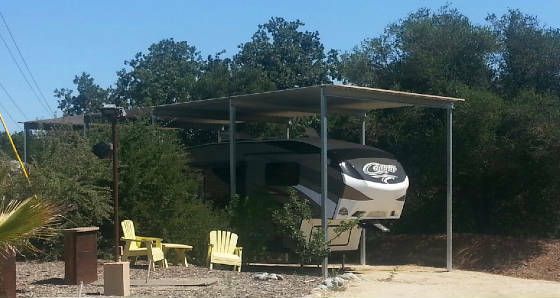 Gabled roof, Mare Motel, 36'x24', with 10' center aisle, and 12' posts, set down into concrete 2 1/2' deep. This unit is ready for installation of pipe panels, and gates, then it's good to go! It's easy to add wood siding to any structure. See our wood siding page for more details. Mare Motels can be custom sized to fit your existing panels. Call us for pricing on any size desired. Need more room in your existing barn? It's easy to add a mare motel on to any building. Just add your own pipe panels and you have much more room to use. Don't have any panels? Call us for pricing on top quality, affordable gates and panels! 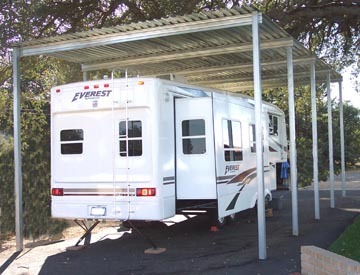 RV Covers can be built to any size desired. It's easy to add siding to any cover. Wood or metal siding will keep wind driven rain, as well as the sun off your valuable property! In this case, the customer painted the galvanized posts white, before installing the factory painted white sheeting.